Why medieval European “types”? Times were simpler then, there were fewer occupations than nowadays, and people were identified by their occupation. The successful matching of a person’s personality to the requirements of the job was necessary to the kingdom’s survival. 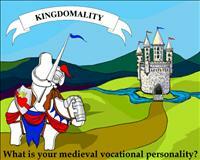 Successful kingdoms were able to incorporate the various vocations into a fully functioning society. Still today, it’s necessary for the success of corporate “kingdoms” to find the right people for each job.